The Barnes X bullet for handguns is a homogeneous solid copper bullet that combines accuracy, power and exceptional penetration. The handgun X bullet comes in two versions, the TAC-XP and the XPB. The designations refer to their expected use, either personal defense or hunting, as there are no differences in the basic construction of these hollow point bullets. Barnes handgun X bullets are known for three noteworthy traits: accuracy, penetration, and the six razor sharp petals that peel back from the bullets nose upon impact and create a cutting wound that promotes bleeding and energy delivery. The accuracy and penetration both arise from the solid copper construction. Because of their exceptional penetration, the TAC-XP may not be the best choice for interior personal protection use when penetration through doors and walls on the far side of the target is a concern. As a hunting bullet, the XPB is exceptional. It expands over a wide velocity range, retains its weight, does tremendous damage and is very accurate, in part because as a solid copper bullet they are slightly longer than conventional bullets. The added length reduces bullet wind drift. Because it is a solid copper bullet, its use is legal in jurisdictions that forbid or otherwise limit the use of bullets containing lead, such as California. This is an XPB designed for use in the 460 and 500 S&W handguns. With a profile more like a rifle bullet than a handgun bullet, it produces improved aerodynamics and terminal ballistics than a handgun bullet with a conventional profile. Cast Performance bullets are lead bullets molded from Lead Bullet Technology (LBT) style molds. They are cast from virgin alloy and hardened to a Brinell Hardness of 18-21. They penetrate deeply and do not fragment on bone. LBT style heat-treated solids are rapidly becoming the standard by which all others compare handgun-hunting bullets. This design of bullet does not depend on expansion as do soft point and hollow point bullets, but in fact the performance level achieved by the LBT design is far superior to conventional bullets. The degree of penetration reported by some of our customers with these bullets is truly remarkable, including full-length passage from end to end on some larger hogs. They don't lead the bore and have been driven as fast as 3,100 fps without causing leading. 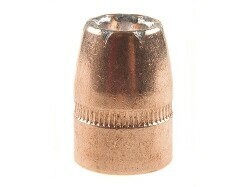 We offer both Gas Checked and Plain Base versions of Cast Performance bullets. The Hornady XTP is formed from a copper jacket over a lead core. The XTP, which stands for eXtreme Terminal Performance, is regarded as an accurate bullet with good performance over a broad range of velocities. It is produced in several versions for different applications. The basic XTP is a hollow point design engineered with skives to promote controlled expansion, typically about 1.5 times the bullets original diameter. It offers controlled expansion and deep penetration. Recommended velocities range from 700 to 1,500 feet per second. Some of the XTP bullets come with a boat tail design and are designated by the inclusion of BT in their name. The Hornady XTP-MAG is a beefed up version of the XTP designed for magnum caliber handguns. It offers controlled expansion and deep penetration over a higher and broader velocity range, from 1,200 to 2,300 feet per second. The XTP-FP is the flat point version of the XTP. It is often but not always used in tubular feed rifles shooting handgun bullets. The flat point is designed to prevent premature detonation in tubular magazines, thought to be possible if the pointed tip of a bullet slams into the primer of the cartridge in front of it in the magazine during shooting recoil. The ENC designation appears on several varieties of Hornady handgun bullets. It stands for Encapsulated, meaning the lead core is contained within the jacket and no lead is exposed. It is intended primarily for us in locations where use of bullets with exposed lead is prohibited, either through certain jurisdictions or specific shooting ranges, most often indoor ranges. The ENC designation appears on Full Metal Jacket (FMJ), Combat/Target (C/T), FMJ-RN (round nose), FMJ SWC (Semi-Wadcutter) and FMJ FP designs. The Flat Nose version is pictured. This a full metal jacket combat/target bullet intended for match use. The Hornady Action Pistol bullet is an XTP redesigned for competitive use. Its a lead core hollow point bullet that is engineered without skives and is not designed to expand. The Nosler Sporting Handgun bullet is an excellent value-priced bullet that performs well in personal defense, target and hunting applications. It has an extremely concentric and tapered jacket of gilding metal, which is built for maximum accuracy, over a pure lead core that allows for reliable expansion across a broad velocity range. A well-defined cannelure holds the jacket and core together and permits a tight crimp that eliminates bullet movement within the case. The Golden Saber is Remingtons offering for law enforcement and personal defense use. This hollow point bullet has some unusual features Remington suggests produce superior performance. Unlike most jacketed bullets in which the jacket is a copper alloy, the Golden Saber jacket is pure brass, which is said to release energy over a longer distance while mushrooming. Additionally, the skives on the hollow point jacket are cut in a spiral rather than straight down, said by Remington to allow mushrooming at a lower velocity. Additionally, this bullet offers match-type accuracy and deep penetration, while providing maximum penetration and nearly 100% weight retention. Sierra bullets have a well-deserved reputation for accuracy. For handguns, they are offered in two broad categories: SportsMaster and TournamentMaster. SportsMasters generally are intended for use against live targets; Tournament Masters for target shooting and competition, with some hunting applications. Each category includes designs with their own unique properties. This is a jacketed hollow point bullet with a small opening at the tip of the bullet and a larger cavity underneath it. The combination provides good flight characteristics and rapid expansion, which is aided by what Sierra calls the Power Jacket, essentially skives in the jacket around the bullets tip. A jacketed hollow point that has the widest opening at the tip of the bullet and a skived Power Jacket that extends to the bullet tip. It is designed to provide flawless feeding in all auto-loading pistols, as well as fast expansion for use at low to medium velocities. A bullet design intended to provide deep penetration. Because the jacket does not extend to the bullet tip, lead from the tip is expected to flow back over the jacket and lock the core in place to help preserve bullet weight. Primarily a bullet for Silhouette competition, this bullet has some hunting applications where deep penetration and minimal expansion are desired. The entire profile of this bullet is covered by a tough jacket, and the heavy base is fully enclosed to withstand the high pressure of magnum cartridges and maintain match accuracy. The bullet is designed to provide longer than usual dwell time on steel plate targets to transfer as much pushing energy as possible. Though this is described as a full metal jacket - and it is according to traditional definition - the base is exposed lead and as such is not suitable for locations that prohibit lead-core bullets that are not fully enclosed by a jacket. It is designed to provide accuracy and flawless feeding in semi-automatic pistols. Its used primarily for practice and competition. Speer was the first company to offer a bonded handgun bullet, so called because of how the jacket is attached to the lead core. Traditionally made jacketed lead bullets begin as separate jackets and cores that are later mechanically attached to each other. Most Speer handgun bullets take a different approach altogether, which Speer designates as Uni-Cor. The lead cores of Speer bonded bullets are placed in an electro-chemical plating system that bonds pure copper to the core one molecule at a time, making jacket/core separation virtually impossible. The jacket thickness is built to the width suited for the intended application and ranges from .0007 inches to .030 inches. The Uni-Cor process is said to create a more concentric and tougher jacket, which promotes more precisely controlled expansion, better accuracy, and exceptional weight retention. In one test, Speer technicians fired a 9mm Uni-Cor bullet across the edge of a steel plate at 1,150 feet per second. Though the bullet was cut in half, no separation of jacket and core occurred, remaining firmly bonded together. All Speer bullets named Gold Dot, Total Metal Jacket, Uni-Cor and Deep Curl are bonded bullets. These four varieties comprise about 85 percent of all Speer's handgun bullets. The remaining bullets are built with traditional cup and core construction..
Gold Dot bullets are Uni-Cor hollow points. Many are intended for self defense, others for hunting. The hollow point versions, many of which are intended for self defense, are manufactured in three steps. First the core receives the bonded jacket; next an oversize hollow point cavity is installed with predetermined expansion folds; and lastly the final cavity shape and volume are set for the optimum performance for the cartridge and intended use. These are self defense Gold Dot hollow point bullets modified for use in the short barreled handguns that have become so popular with the advent of concealed carry laws in most states. They have wider hollow point openings and deeper cavities than standard Gold Dot hollow points and are designed to expand well at lower velocities produced by short-barreled guns. They are available in calibers .357, (.38 Special and .357 Magnum), .400 (.40 S&W), .429 (.44 Special and .44 Remington Magnum) and .451 (.45 ACP, .45 Auto Rim, and .45 Colt). Bonded bullets that in the smaller calibers are intended for small game an d practice. Some of these bullets carry the Gold Dot name, others do not, though all are bonded bullets formed by the Uni-Cor process. In 44 and 45 caliber the 300 grain Uni-Cor Soft Points and the 350 grain Uni-Cor Soft Point in 50 caliber, for the 500 S&W (not 50 AE), are designed to provide deep penetration and minimal expansion similar to that produced by heavy cast bullets. Some of these bullets, but not all, recently have been re-named "Deep Curl." These are Gold Dot bullets intended primarily for hunting. They tend to run toward the heavier end of the bullet weight spectrum for any given cartridge. For some cartridges, notably the .41 Remington Magnum, they are the only Gold Dot available and serve equally well for personal protection. A Uni-Cor bullet in which the jacket covers the entire bullet, including the base. This makes these bullets legal for use in jurisdictions that prohibit use of bullets with exposed lead. They also eliminate fouling in compensated pistols caused by hot gases melting lead at the exposed lead base of a traditional full metal jacket bullet. These bullets are used mainly for target shooting and plinking. A Uni-Cor bullet designed for 45 caliber competition, the 185 grain for Bulls-eye and the 200 grain for International Practical Shooting Confederation/United States Practical Shooting Association competition. Both produce sharp, clean holes and have long noses for reliable feeding. The 200-grain version can be loaded to achieve IPSC major power factor. A 180-grain Uni-Cor bullet in .357 caliber for metallic silhouette competition. It has a reputation for accuracy and power at long range. A small portion of the Speer handgun bullet line, these traditional cup-and-core bullets use a tapered jacket design to limit jacket rollback and thereby increase penetration and reduce the possibility of jacket/core separation. The A-Frame is a premium hollow point hunting bullet with a reputation for expansion, deep penetration and exceptional killing power. It is similar to the Nosler Partition in that it has a cross-member dividing the lead core into two parts, but it differs from the Partition in that the front core of the A-Frame is bonded to the jacket. The bonding produces excellent mushrooming without loss of weight, which promotes deep penetration and wide wound channels. A-Frames typically retain about 95 percent of their original weight and expand to about double their original diameter. They are available for the .44 Remington Magnum, .454 Casull and the .460 S&W.